ECHNO, Rome, Italy · 2018, Hoffmann C. et al. In the treatment of head and neck squamous cell carcinoma (HNSCC), elderly and frail patients (pts) are ineligible for chemoradiation with cisplatin, the non-surgical standard of care. Consequently, innovative research tends toward a new treatment option, NBTXR3. These first-in-class hafnium oxide nanoparticles are activated by radiotherapy and physically destroy cancer cells. They are currently evaluated in a phase I clinical trial [NCT01946867] for locally advanced HNSCC in the population of interest. 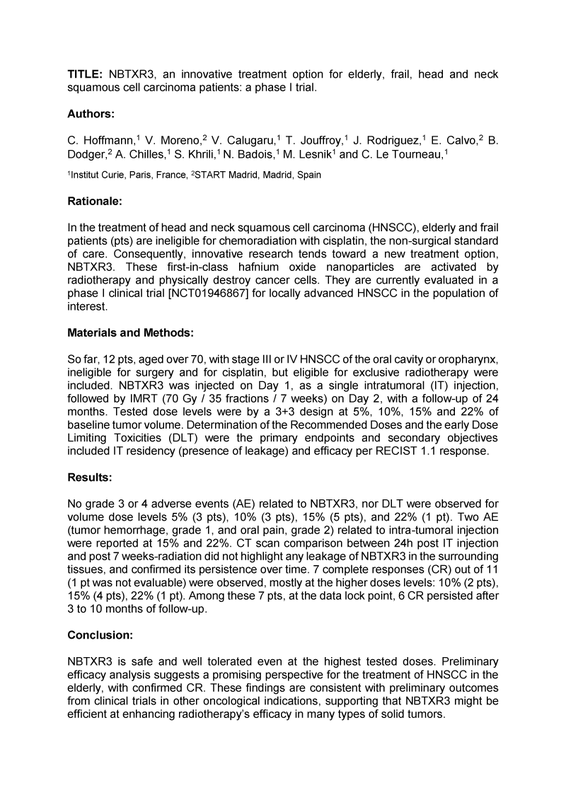 At the ECHNO 2018 in Rome, Italy, preliminary results were presented and NBTXR3 resulted as safe and well tolerated even at the highest tested doses. Preliminary efficacy analysis suggests a promising perspective for the treatment of HNSCC in the elderly, with confirmed complete responses.